Kosmos eSync is the fastest, easiest and most accurate way to sync orders, items, inventory and more between Lightspeed Retail and leading ecommerce platforms, such as BigCommerce, Shopify, WooCommerce, Magento, X-Cart, Amazon and eBay. Kosmos Central is the developer of eSync, a cloud application that integrates Lightspeed Retail with your ecommerce platforms, allowing you to manage items, automate tasks, track orders, and more, all from one place, and in real-time. 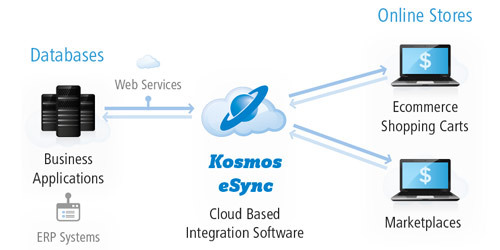 Whether your are a small business with a single web store or a major corporation with numerous divisions and locations, Kosmos eSync provides integration solutions to streamline the management of your business.